In “Engineers and Communities: Transforming Sanitation in Contemporary Brazil,” I explain the variety of policy outcomes that were achieved by activist engineers, progressive politicians and organized communities, and I show that the new model of participatory sanitation was established not as the result of empirical evaluation but as part of a larger set of ideologies, or myths, of development. Earthea Nance is a certified floodplain manager and a board-licensed professional civil engineer with nearly two decades of practice in the environmental engineering field. She is Associate Dean for Student Affairs in the Barbara Jordan-Mickey Leland School of Public Affairs at Texas Southern University and holds joint faculty appointments in the Department of Urban Planning and Environmental Policy and the Department of Political Science. Her research focuses on the intersection of environmental hazards, community participation, and urban infrastructure in complex settings such as vulnerable communities, developing countries, and high-hazard areas. Earthea Nance. 2012. 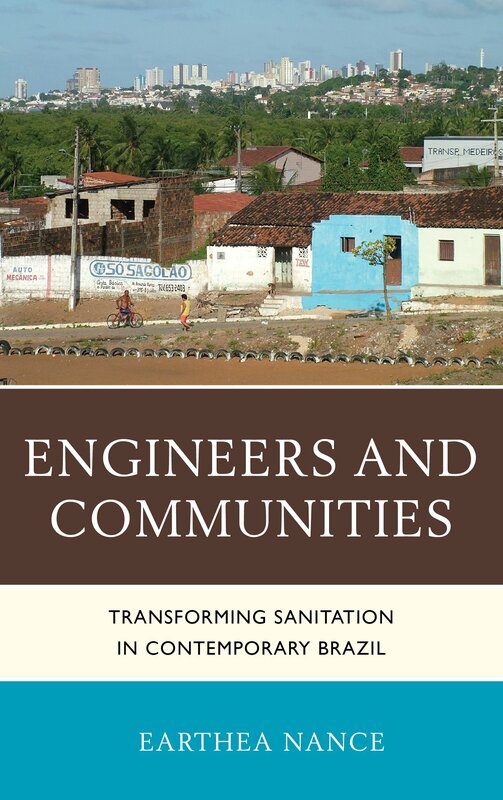 Engineers and Communities: Transforming Sanitation in Contemporary Brazil, Lanham, MD: Lexington Books. Earthea Nance. 2009. “Making the Case for Community-Based Laboratories: New Strategies in the Environmental Justice Movement.” In Race, Place, and Environmental Justice After Katrina (by Robert Bullard and Beverly Wright, eds. ), pp. 153-166. Boulder, CO: Westview Press. Earthea Nance. “Floodplain Decision-making under Uncertainty: The Local Response to FEMA’s 2008 Digital Floodmap Release in New Orleans” (in progress). Beverly Wright and Earthea Nance. 2012. “Toward Equity: Prioritizing Vulnerable Communities in Climate Change,” Duke Forum for Law and Social Change 4(1):1-21. Kevin Fox Gotham, Richard Campanella, Josh Lewis, Farrah Gafford, Earthea Nance, and Mallikharjuna R. Avula. 2011. “Reconsidering the New Normal: Vulnerability and Resilience in Post-Katrina New Orleans,” Global Horizons: The Journal of Global Policy and Resilience 4(2):54-68. Earthea Nance. 2010. “Reforming Mitigation Programs: A New Orleans Case Analysis,” The Public Manager 39(3):32-37. Louise K. Comfort, Thomas A. Birkland, Beverly A. Cigler, and Earthea Nance. 2010. “Retrospectives and Prospectives on Hurricane Katrina – Five Years and Counting,” Public Administration Review, 70(5):669-678. Earthea Nance. 2009. Responding to Risk: The Making of Hazard Mitigation Strategy in Post-Katrina New Orleans, Journal of Contemporary Water Research and Education. Issue 141, pp. 21-30. Earthea Nance and Leonard Ortolano. 2007. “Community Participation in Urban Sanitation: Experiences in Northeastern Brazil,” Journal of Planning Education and Research 26, pp. 284-300. Earthea Nance. 2005. “Multistakeholder Evaluation of Condominial Sewer Services,” American Journal of Evaluation 26(4), pp. 480-500. Ann E. Farrell, Bert Michalzyk, and (Earthea) Anaya Nance. 1990. "Evaluating the Impacts of Sludge Incineration Using a Risk-Based Approach,” Water Science and Technology 22(12), pp. 75-83. Earthea Nance, Journal of Environmental History 12(1), pp. 156-157, 2007. Book Reviewed: Echoes from the Poisoned Well: Global Memories of Environmental Injustice, edited by Sylvia Hood Washington, et. al., Lanham, MD: Lexington Books, 2006. Earthea Nance, Journal of the American Planning Association 71(4), pp. 467-468, 2005. Book Reviewed: The Quiet Revolution: Decentralization and the Rise of Political Participation in Latin American Cities, by Tim Campbell, Pittsburgh, PA: University of Pittsburgh Press, 2003. Shirley Laska, Pamela Jenkins, Robert Montjoy, Monica Teets Farris, Earthea Nance, Michelle Gremillion, Joel Devalcourt, and K.C. King (University of New Orleans); Branda Nowell and Thomas Birkland (North Carolina State University). “Achieving Successful Long-Term Recovery and Safety from a Catastrophe: The Federal Role,” A Report to the Ford Foundation, UNO Center for Hazard Assessment, Response, and Technology, June 2010. Earthea Nance, W. Fisher, J. Schwartz, and D. Quinn. “GreeNOLA: A Strategy for a Sustainable New Orleans,” City of New Orleans, 2008. Gina Solomon, Earthea Nance, Sarah Janssen, William Brice White, and Erik Olson, “Drinking Water Quality in New Orleans: June–October 2006,” The Natural Resources Defense Council, Inc., 2007. Earthea Nance, “Putting Participation in Context: An Evaluation of Urban Sanitation in Brazil,” Ph.D. Dissertation, Stanford University, 2004, Dissertation Abstracts International, 65(04), 2035B (UMI No. 3128354). Abstract appears in the Journal of Planning Literature, May 2005. Moehser, Harald, (Earthea) Anaya Nance, and Edward D. Schroeder, "Removal of the Halogenated Organic Compounds 1,2-Dibromo-3-Chloropropane, Ethylene Dibromide, Trichloroethylene, Tetrachloroethylene, 1,1,1-Trichloroethane, and Carbon Tetrachloride from Water Supplies by Granular Activated Carbon Adsorption, A Report to the California Public Health Foundation," Dept. of Civil Engineering, University of California, Davis, 1987. Earthea B. Nance is a certified floodplain manager and a board-licensed professional civil engineer with nearly two decades of practice in the environmental engineering field. She is Associate Dean for Student Affairs in the Barbara Jordan-Mickey Leland School of Public Affairs at Texas Southern University and holds joint faculty appointments in the Department of Urban Planning and Environmental Policy and the Department of Political Science. Her research focuses on the intersection of environmental hazards, community participation, and urban infrastructure in complex settings such as vulnerable communities, developing countries, and high-hazard areas. Dr. Nance earned her BS in Civil Engineering and MS in Environmental Engineering from University of California-Davis, and her PhD from Stanford University. For two decades Dr. Nance has worked to restore and protect the environment, to mitigate ecological and technological hazards, and to examine the social and environmental dimensions of engineering projects. She has served as Engineer at: Uribe & Associates Environmental Consulting; F.E. Jordan & Associates, Inc.; Lawrence Livermore National Laboratory; and James M. Montgomery Consulting Engineers. Dr. Nance has also served as Director of Disaster Mitigation Planning, Ford Foundation/City of New Orleans and of Infrastructure & Environmental Planning, Ford/City of New Orleans. Her areas of work include environmental engineering and planning, hazard mitigation, floodplain management, sustainable urban development, water and wastewater treatment, water resources, hazardous and nuclear waste, alternative energy, environmental remediation, community participation, and international water and sanitation. She also has contextual expertise in Brazil’s Northeast Region (including Portuguese language) and in the US Gulf Coast (Hurricanes Katrina, Gustav, Ike, and Isaac); as well as research experience in Mozambique and Pakistan. Prior to arriving at TSU she was assistant professor of environmental planning and hazard mitigation at the University of New Orleans, and a faculty associate in the Center for Hazards Assessment, Response, and Technology. Dr. Nance has also served as Assistant Professor of urban affairs and planning in the School of Public and International Affairs at Virginia Tech (Blacksburg campus). As an MLK Visiting Professor at MIT, Dr. Nance was hosted by the Department of Urban Studies and Planning. Her visit combined teaching and writing, as well as leading a research trip to Brazil. She taught an advanced seminar in water and sanitation and in the Spring of 2007 jointly developed a course with Prof. Susan Murcott (research engineer in civil engineering) titled Water and Sanitation Infrastructure in Developing Countries (11.479J / 1.851J). Dr. Nance also directed a research trip to Recife and Natal, Brazil, during MIT's Independent Activities Period (IAP) 2006. Her visit to MIT included writing Engineers and Communities: Transforming Sanitation in Contemporary Brazil (Lexington 2012), a book about reforms to the water and sanitation sector in Brazil. After her time as an MLK Visiting Professor, Dr. Nance was awarded a $37K grant from the Gulf Coast Ecological Health and Community Renewal Fund of the Rockefeller Philanthropy Advisors Foundation, the largest award at the time to a grassroots organization. Dr. Earthea Nance is a scientist from the University of New Orleans, who has been involved in community outreach for local fishing communities. Together with Dr. Gina Solomon (NRDC), she has been measuring air and water quality in the Gulf Coast areas that have been affected by the BP oil drilling disaster.